You are here: Home ∼ 2013 ∼ February ∼ How tolerant are we? I was at the Jaipur literature festival last week, and just when I landed in Jaipur on Sunday I hear that Ashish Nandy had to leave the place. He was supposed to be in a session on Sunday at 11AM, but he could not be present. On my flight back to Mumbai, the newspapers mentioned about Salman Rushdie not being allowed to the Kolkata literary meet. The whole of last week and this week we have been hearing about Viswaroopam, Kamal Hassan’s latest movie, not being allowed to release in some of the south Indian states. This is inspite of the fact that the censor board has given it a clean chit. Why? Why have we become such an intolerant state? Why do we assume that the religious sentiments of the public would be hurt at the slightest provocation? Were we always like this? Not really. This is the country where KamaSutra has flourished. Religious tolerance leads to creative thinking and as a famous poet put it, where the mind is without fear. In my opinion, we are still a very tolerant state. What else could explain our “chalta hai” attitude towards the daily hurdles in our life. The hurdles which are created by decades of corruption and mismanagement by our leaders and we still admire, respect and forgive them. We tolerate them. It is the same people in power, our so called leaders, who most of the times use the innocent amongst us to instigate fire to further their own personal agendas. This is what we should be wary of. Coming back to the topic, What exactly is religious tolerance? 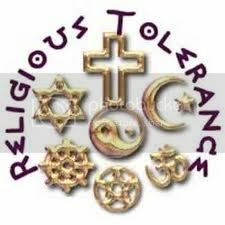 Religious tolerance is the policy to extend religious freedom to people of all religious traditions, even though one may well disagree with their beliefs and/or practices. Having tolerance toward another religion does not require one nto endorse that faith group’s beliefs; it simply indicates one’s respect for its right to exist and for its member to hold different beliefs without being oppressed. In simple words, it is “Live and Let Live”. In our 21st century globalized world it is all the more important that each one of us possess this quality for a harmonious living. For India to be a superpower, we need to encourage people of all dissidents to our country, and this would require a huge amount of cultural sensitivity for everyone to co-exist and flourish. We would all have to strive to ensure such a culture of mutual respect develops into the daily mindset of everyone and some vested forces cannot influence it.